Instantly reach the people you care about. Messenger is a fast, free and reliable way to stay in touch. It's just like texting, but you don't have to pay for every message (it works with your data plan). Conflicting app error? Please delete any previous version of Facebook Messenger on your device before installing this version. - Fixed '?' issue in receiving non-english messages. 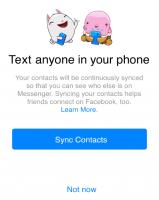 Text your phone contacts, even if you're not Facebook friends. Share your location so people know when you're nearby.